I remember as a little girl going to camp for just one summer. I had the kindest, most beautiful camp counselor ever. I’ll call her Miss B. I will never, ever forget her kindness to me. She placed my cot next to her bed at night, and she really tried to build me up. But because of what happened to me during the summer months in the boarding school, it wasn’t easy to accept this outpouring of love from Miss B. I was always wondering why she was being so nice to me. Was she going to molest me too? Would I wake up in bed with her, the same way I woke up other times before? Every year, as was the tradition in this camp, they would pick a Queen for the Day. One queen was chosen from each age group. I was probably four or five years old at the time. Each camper from each group would have to pick a card, and the one who chose the queen of hearts was the winner. When Miss B got to me, she let the card slip just enough for me to see what it was. She looked at me and then down at the card. Again and again she looked at me and then at the card. She was practically placing it in my hand. Miss B wanted me to be Queen for the Day. “You don’t deserve to be Queen for the Day” started to scream from within. My mind was saying one thing—“Go ahead, pick the card; this is your big chance”— but my heart was confirming what had been my reality. I was the little girl who didn’t have a mother because God didn’t think I deserved one. If God didn’t think enough of me to let me have a mother, then how could I think well enough of myself to be Queen for the Day? I agreed, as I always did, with that voice within, and I chose another card. It was so much easier to live the way I always had than to become someone different, someone significant. I believe I saw a tear fall from Miss B’s eye. I had not thought of that story for many, many years, but one day as I was speaking at a conference, the Holy Spirit suddenly brought it to mind. As I was recounting the event, a woman got out of her seat, walked down the aisle, interrupted the meeting, and handed me a card. It was the queen of hearts! She said as she was leaving to come to the conference, the Holy Spirit told her to go back into the house and get the queen of hearts out of a deck of cards she had in the house. She said, “What? Come on, Lord. That’s so odd.” But the impression was so strong that she just couldn’t ignore it. When she handed me that card in front of all those people at that church in North Carolina, I fell to my knees and started to weep. That God would remember the turmoil I endured that day and affirm me in front of those women was a very hard concept for me to grasp. I’ve had amazing things happen to me throughout the years-amazing things orchestrated by God alone. But I’ve come to realize that although great things happen to you, they won’t change you. The change has to happen in you! Even though God opened these incredible doors of ministry that I carefully walked through, I still needed a thorough cleansing to change how I viewed myself in my heart. 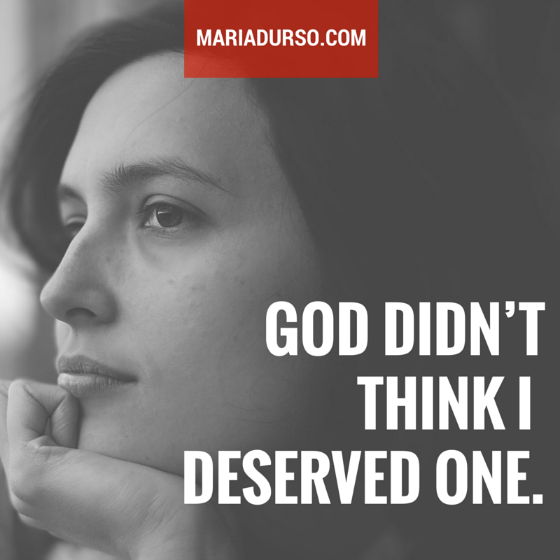 Question: Have you ever believed God doesn’t think you deserve someone or something because of your past? Oh, Maria, that was such an absolutely amazing, perfectly precious way for God to remind you of His great love for you! It was a totally personalized way for Him to reassure you of His care for you throughout your life, even long before you were aware of Him. He guarded you, and wept with you through all the painful events that caused you so much anguish. He brought you through them into a place of joy, and ministry to many, many other hurting, wounded people. I love and respect you very much. Please don’t ever again allow the enemy to cause you to doubt your great worth to God. God bless you!